Citigroup is one of several big-name stocks set to post earnings results over the next few trading days. Stocks gave up more ground last week, due to concerns over an escalating trade war and news that job growth slowed in the U.S. during the month of March. 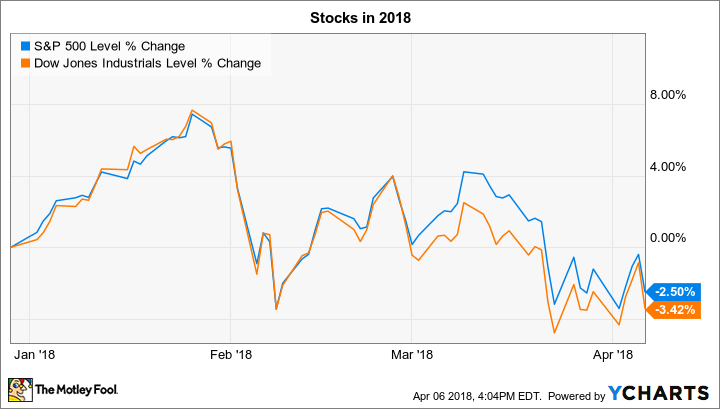 Through the last five trading days the Dow Jones Industrial Average (DJINDICES:^DJI) and the S&P 500 (SNPINDEX:^GSPC) each shed about 1% to bring year-to-date losses to roughly 3%. First-quarter earnings season kicks off over the next few trading days, and the most anticipated reports will be coming from MSC Industrial (NYSE:MSM), Bed Bath & Beyond (NASDAQ:BBBY), and Citigroup (NYSE:C). Here are trends for investors to keep an eye on in these announcements. Industrial parts specialist MSC Industrial Supply will post its results before the market opens on Tuesday. Its last quarterly report was mixed, with average daily sales rising 8% as gross profit margin slipped. However, CEO Erik Gershwind and his team said at the time that there were good reasons for optimism about both these core metrics. Suppliers are finally starting to raise their prices, which should leave room for MSC Industrial to boost its prices, too. Manufacturing activity appeared to be speeding up as well, a boost that might have been accelerated by recent tax law changes. MSC Industrial's forecast calls for sales to rise by 9.1%, at the midpoint of guidance for between $761 million and $775 million. Executives are targeting earnings per share of between $1.93 and $2.03. Bed Bath & Beyond announces its fiscal fourth-quarter results on Wednesday afternoon. The home-furnishings retailer has been struggling lately with falling customer traffic, which has led to reduced profitability as it cut prices to keep inventory moving. Operating profit tumbled over the past nine months, diving to $424 million from $705 million in the year-ago period. And its most recent quarter was marked by a modest decline in comparable-store sales. The stock has dropped significantly in response to that earnings slump, and the dip could set investors up for decent returns from here. However, the business will first have to demonstrate that it can reliably grow sales at its 1,600 stores while profitably expanding its digital distribution channel. That will be a tough bar to meet given today's competitive selling environment in its industry. Thus, it's likely that Bed Bath & Beyond will announce lackluster sales results this week, while detailing plans to cut costs as aggressively as possible in hopes of adjusting to the new lower pace of customer traffic. Bank stocks outperformed the broader market by a wide margin in 2017; with their fiscal first-quarter results due to start coming out this week, it's time to find out how much of that momentum will carry on into the new year. Citigroup is one of the first financial giants to issue its numbers, and investors are optimistic that it will have good news to announce. Its last quarterly outing showed progress in management's long-term initiatives, including an improved efficiency ratio, higher capital returns to shareholders, and steady growth in its consumer banking segment. In early comments on the upcoming fiscal year, CEO Michael Corbat and his team said they're targeting healthy growth both in the bank's return on invested capital and in its return of capital to shareholders. Citigroup's reputation as a slightly riskier bank has kept its valuation lower than those of many of its peers. However, it seems to be slowly shedding that reputation, and could make more progress in that direction by announcing better capital-generation numbers on Friday.